‘Just shy of fourteen quid to ride the best part of 200 miles.’ That’s not even the best bit, as Kev tells us why the Honda NC750X is a consummate mile-muncher; boring, banal and brilliant in every way. I disagree, and I do so with thinly veiled contempt. You would have to be an absolute cretin to find fault in this engine, given the purpose of the motorcycle. Only an inveterate bike snob could complain about the way the NC750X goes about its duties. The NC is punchy, but not violent; capable but not ostentatious, fast enough for towns or motorways, but without the risk of jail time if you get carried away. You could kill yourself on the NC, but it would have to be a fairly deliberate act or one informed by considerable stupidity. It is true that the engine redlines at six and a half, but that is not a problem; certainly not as much of a problem as I found the engine in my old R6 to be, which would practically stall if you didn’t keep it ‘ticking over’ above 7. 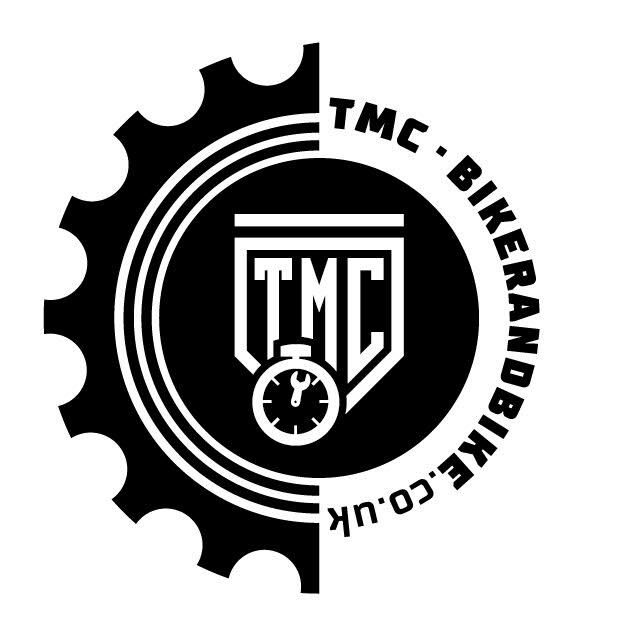 Which is more rewarding for most people’s daily ride? A bike that offers usable power at legal speeds or one that only operates screaming its nuts off in the mid-teens? I have ridden both, and I can assure you, day in day out, it’s the former. Ah, deep breaths Turner…zen…Let’s summarise: this is a good motorcycle engine. There. Time to move on, to discuss the practicalities of owning a Honda NC750X. To put that into some sort of real-world context, my motorway ride from Shrewsbury to Enfield north London, then on to Crystal Palace (South London), though crawling stop/start London rush-hour – a distance of 180 miles, give or take – never costs me more than £14. The main rivals – the smaller BMWs, Kawasaki’s Versys, the V-Strom and Yam’s Tracer – don’t get close. The other day I missed my exit off the M1 and ended up taking a 50-mile detour; I got 207 miles out of a tank that was far from dry, and it cost me just over £15 to brim it. Alongside the mpg figures, the storage space where the fuel tank would normally be is a strong selling point of the NC and it is a genuinely inspired concept, certainly no gimmick. It holds my locks, chain lube and waterproofs and frees up precious space in my top box. It does not, however, store my lid, because my particular Arai doesn’t fit. My other lids, an old Shoei and another Arai, do squeeze in, so it’s clearly the size and shape of the Arai (Quantum ST Pro) that is the issue here. Anyhow, the storage space is a genuinely useful and positive feature and Honda should be applauded for having the guts to try something innovative in an age when ‘innovation’ usually involves a different coloured dash or even more traction control settings. With the tank taken up for storage, the fuel filler is found under the pillion seat, which works well. 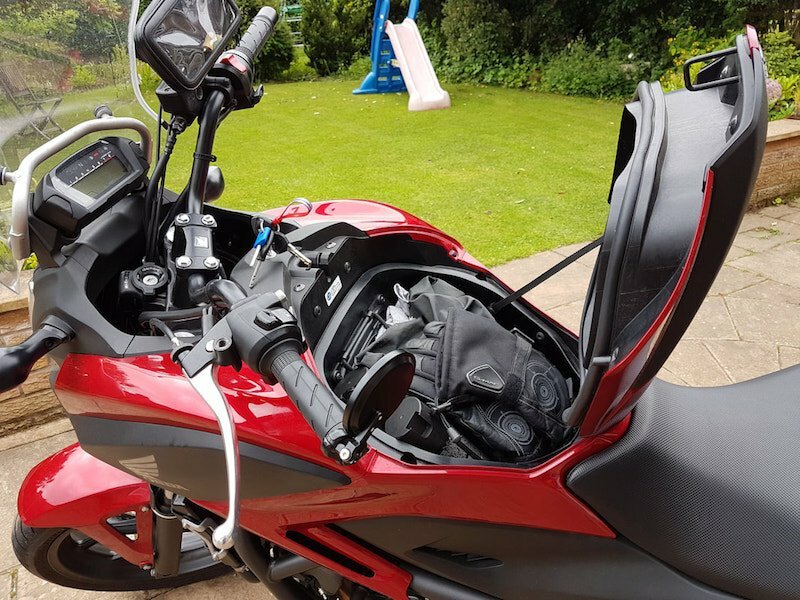 I read somewhere that it would be a pain if you had your tent strapped across the back of the bike, which is true, but no more so than having to remove a tank bag every time you fuel up a bike with a conventionally placed filler. The brakes are duel-linked ABS, which I could do without but this is the standard package. They stop the bike fine, but another disk up front wouldn’t have gone amiss; as noted, it is a heavy machine. That said, I have never felt that a little more pressure wouldn’t haul the bike up before a big impact and while I’ve not yet had cause to try the ABS, I’m sure it does the fine job. 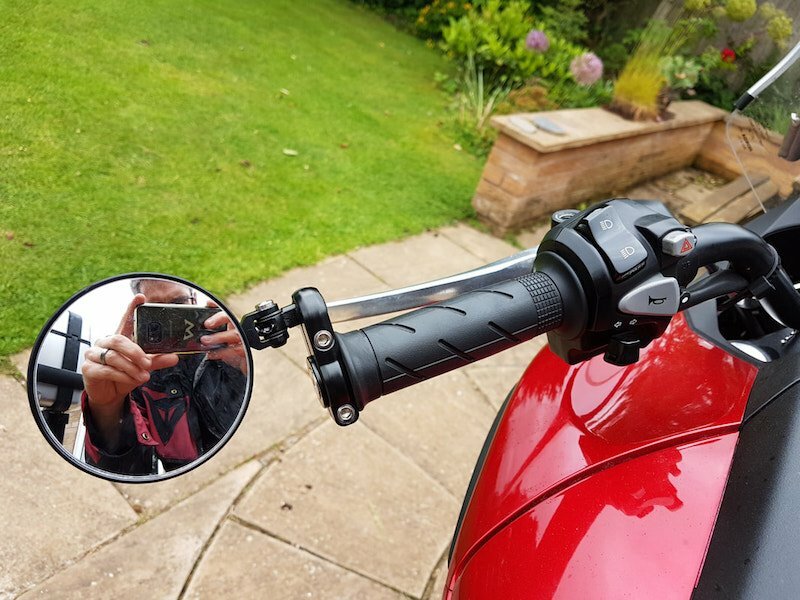 The touring screen is an important add-on, although it came fitted to mine by the previous owner and I’ve not ridden without it so can’t comment on how much difference it makes. I read that it creates buffeting and is a bit noisy, but I’ve not found either a problem. That said, when I stumbled across a screen extender, for a mere £15 on eBay, I thought I’d give it a try anyway. I’m glad that I did. The wind noise and buffeting that I hadn’t really noticed drops to almost non-existent with the extender fitted, so much so that I can ride along at 70mpg with my visor open and not look like I’m free-falling from 20,000 ft.
Fitting it is pretty simple – despite a complete absence of instructions – and it seems well made. It’s adjustable for height and angle and mine is set at almost vertical and maximum height. I fitted an Evotech Performance radiator cover, mainly because I liked the look of it and a fender extender to keep some muck off the downpipe (don’t worry about drilling your mudguard, it’s a two-minute job and the little rivets look quite tidy). 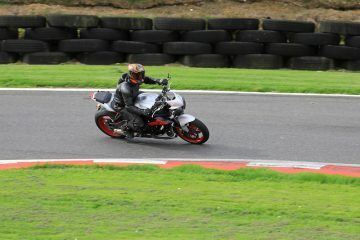 I also banged on an R&G hugger to take the pain off the shock and as somewhere to place performance-enhancing stickers. Finally, I removed my left-hand wing mirror to make filtering easier (the mirrors sit at almost the exact same height as those on vans). I replaced it with a little bar-end mirror to give me some token visibility on the near side. It works well at lower speeds but tends to fold in a little on the motorway, changing the rear field of rear; it’s not without fault but remains a useful addition. 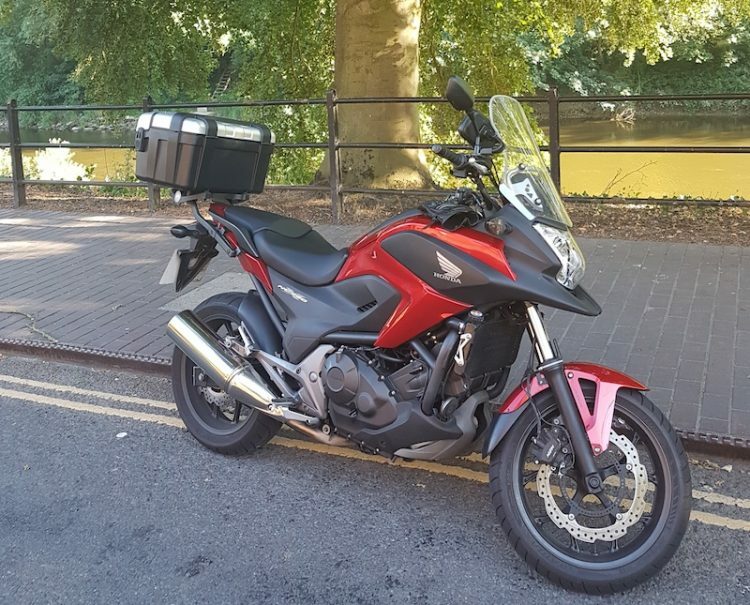 I also splashed out on a big 46 litre Givi top box. 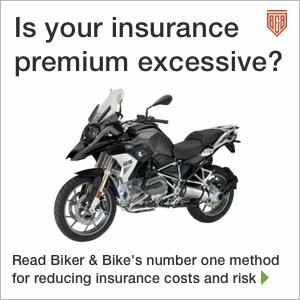 Givi seems determined to make the process of buying their products as complicated as possible. 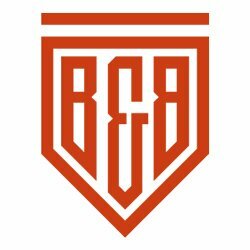 I pestered the team at Sportsbikeshop.co.uk – whose service is consistently impeccable – for advice and they explained in simple terms what was needed to fit it. It is very simple: a plate, some arms and the box. Why not bundle them Givi? Why????? The box is big, but not too big. It’s not intrusive and doesn’t hamper filtering. It locks up nicely, is very waterproof, but does feel a bit plasticky, but that can’t be helped because it’s made of plastic. Finally, one small point of irritation; there is no on/off switch for the lights. I appreciate this is likely due to some regulation or other, but it concerns me that in a scenario where I need to escape from baddies at night in the woods, I would be forced to either smash my headlight and taillight (expensive), remove the bulbs (time-consuming….baddies are after me) or cover both head and taillight somehow. In such circumstances, I don’t want to be stumbling about the bracken searching for some opaque material large enough to cover a sizable illuminating area, so perhaps this is something Honda could address in future iterations of its motorcycles. 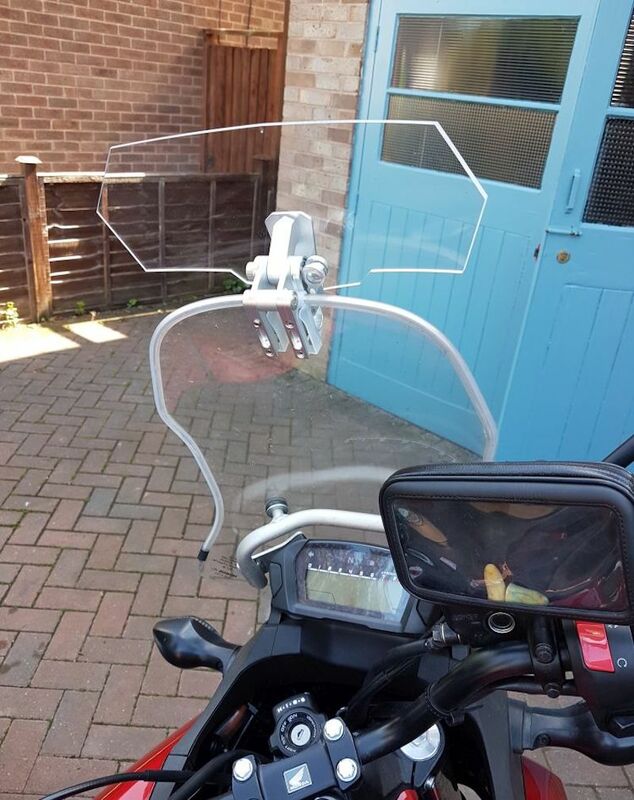 Fork protectors (Bike It, via Sportsbikeshop) – Dead easy, a couple of cable ties. 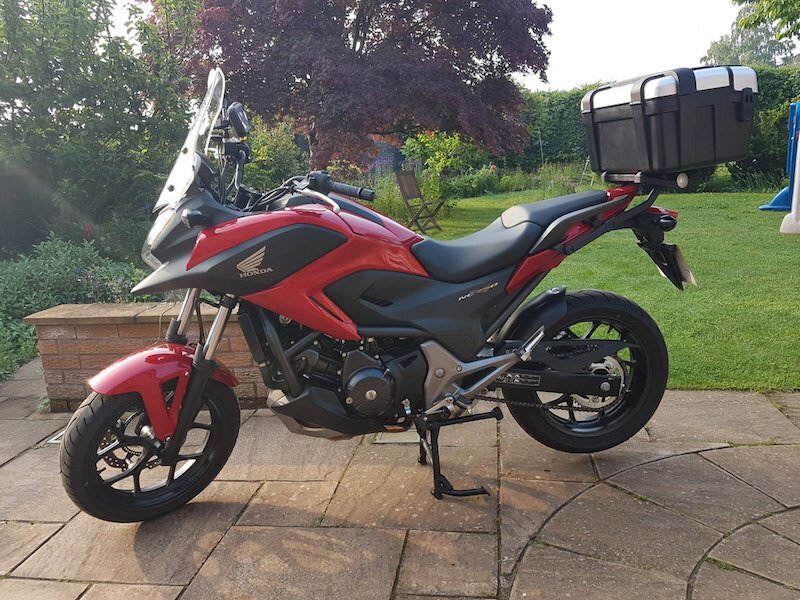 Top box (Givi, via Sportsbikeshop) - Easy, takes an hour or so. Hugger (R&G) - Fiddly but not difficult. Radiator cover (Evotech Performance) - Simple, just don’t over-tighten the bolts on the arms. – Harder to get the original bar-end out then to get this one in. Fender extender (Pyramid Plastics) – Dead easy, don’t be afraid to drill your mudguard, the rivets cover up the holes and look very tidy. Screen extender – No instructions but pretty simple to fit by looking at the images on eBay; took me about 10 minutes. 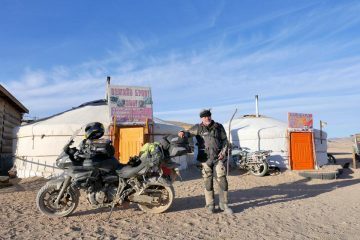 Read more from Kevin on his personal blog, The Hapless Biker.